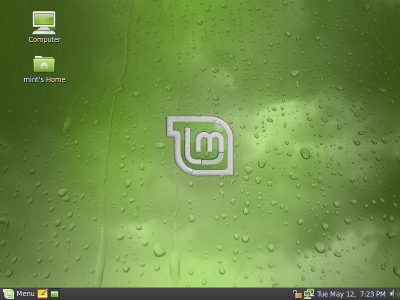 The team is proud to announce the release of Linux Mint 7 “Gloria”. While it’s downloading look at the videos and the overview of the new features in Linux Mint 7, read the User Guide and make sure to quickly go through the known issues. Burn the ISO at low speed and enjoy Linux Mint 7. The 7th release of Linux Mint comes with numerous bug fixes and a lot of improvements. In particular the menu system, the application manager and the upload manager now provide new features such as “Suggestions”, “Featured applications”, “SCP and SFTP support”. The underlying base of the operating system was also strengthened with a new adjustment mechanism which makes Linux Mint more robust and less vulnerable to Ubuntu package upgrades, and the introduction of virtual and meta packages which simplify upgrade paths and the installation of multiple desktop environments. For a detailed overview of the new features and improvements included in Linux Mint 7, please read What’s new in Gloria. It comes with built-in support for English, French, Spanish, German, Italian, Swedish, Danish, Chinese, Korean, Portuguese/Br, Portuguese/Pt, Arabic, Hungarian, Lithuanian, Galician, Dutch, Russian, Polish, Norwegian, Japanese, Ukrainian, Romanian, Slovenian, Catalan, Greek, Czech, Slovak, Marathi, Norwegian [nynorsk], Croatian, Bulgarian, Turkish, Hindi, Finnish, Hebrew, Serbian, Belarussian and with partial support for Basque and Bosnian. It comes with no codecs, no support for restricted formats and no proprietary components. It uses a text-based version of Grub instead of the graphical grub-gfxboot which comes with the Main Edition. The purpose of the Universal Edition is to bring a localized live system to non-English speaking users of Linux Mint and to facilitate the distribution of Linux Mint in countries where software patents are enforceable. The root password is now set as the same as the one chosen during the installation. A blog post will follow to explain why and how this was implemented. Our partner on-disk.com ships Linux Mint 7 Worldwide for as little as $10. They also contribute $5.41 to Linux Mint for each CD/DVD sold. Linux Mint 7 can be purchased as a liveCD/DVD, as a virtual machine or as a live media (Flash/SD/CF) from here. To upgrade to Linux Mint 7 from Linux Mint 7 RC1, launch mintUpdate, enable the “dist-upgrade” option in the preferences window and refresh the list of upgrades. Make sure to apply all level 1 and level 2 upgrades. Among level 3 upgrades make sure to select gtk2-engines-aurora, gufw, smplayer, and nautilus-sendto. An upgrade path for Linux Mint 6 “Felicia” users will be published in a few days. Have a lot of fun with “Gloria” and let us know what you think. Reviews will be answered and your feedback will be used to improve the distribution before the next release. We hope you enjoy this release as much as we enjoyed making it and we wish you a very nice experience with Linux Mint. Previous Previous post: ETA for a Mint 7 stable release? Thanks Clem! Installed it last night and it is working like a charm. I appreciate everyone’s hard work. thanks, thanks, thanks Linux Mint Team !!! That is a great news! I am wondering about the XFCE and LXDE CE’s. Is there any new information about them? You should tighten the communication in team and with community. is the smae intel graphics problem found in jaunty, also in mint 7? everything looks great… like the new theme! Awesome stuff man. Cant wait for the x64 edition! I’ll waiting for the upgrade. Thanks for your great work on Linux Mint! thanks, thanks, thanks Linux Mint Team 🙂 !!! x64 bits? When? or where is it ? Just got done installing it. great job Clem! Awesome stuff, downloading torrent now and will seed! Great work to everybody involved! Rock on! I just downloaded the iso and can’t wait to get started! Where is the x64 edition? I need it!!!. Is Ati Xpress card drivers fixed? or can we use more suitable driver then ubuntus? I have the same doubt as hoppy785. How well do the Intel graphic cards work in Mint? The same as with Jaunty? Woot, thanks to everyone involved! Will it be 2 months before x64 edition? I am wondering if I should hold off and wait for 7 x64 before trying Mint on my main computer. Exciting news. Waiting for the Felicia upgrade. Ive been using it since yesterday as I downloaded it from heanet on Sunday. Im loving it. Everything worked by default. It boot faster than Felicia. great news. looking forward to the 64 bit version. thanks. I’ve downloaded and installed. It is working like a charm! Thanks for LinuxMint team for there hard work! And again, thank you very much and congratulations!! it is working very, very smoothly like a computer oasis. Great job!! Monsieur Lefebvre : L’effort que vous et l’équipe de LM ont fait pour se nous donner LinuxMint 7 “Gloria” est admirable. Il est évident que je l’installerai dans mon ordinateur, car “Felicia” m’a donné une idée de ce qui est une distro faite avec du bon goût et du beaucoup de sérieux dans ses objectifs. Il n’y a pas de doute que LinuxMint 7 attirera plus d’utilisateurs enthousiastes et, par surtout, de ceux qui bougent pour les marécageux quartiers de Windows. Thank you for a nice OS!! A happy Linux Mint user from Norway. YEAH! Finally an excuse to format the hard drive and install from scratch. I’m so looking forward to this… Last time I was waiting for a release date this eager, it was for the last Red Hot chili Peppers CD! I tried it with ext4 but had a few lockups on the first day so have reverted back to ext3 and ok so far and definitely faster, I think I’ll do as exploder said and switch when ext4 is stable and becomes the default. Thnx. How long it will take for X64 version to be released? Is there any ETA 🙁 ? Waiting for the upgrade path from felicia :(. Also looking forward to x64 edition. Can’t get this to work with unetbotin. I need the iso bootable so I can install it on a usb stick to put it on my Mini 9 netbook. Alas, it doesn’t find the kernel when it tries to boot from the usb stick. Any thoughts? Beauty and function in the same package…great job!! Much appreciated. I installed on the 25th, by getting a beta copy. In one word – GREAT. Yahoo! Finally my waiting is over. Is an upgrade from Mint7 RC Gloria identical to doing a clean install of this released version. I have the RC version running sweetly at the moment jf there are no disadvantages, I will go with the upgrade path ? Thank you guys, you rock!! Thank you, thank you, thank you. What a great OS. Hope that those that recognize the value of Mint 7 will pass the word and a possible donation. why there has no such thing as “remote desktop connection”? Ok, but…When will Linux Mint 8 ‘Helena’ be released? I can’t wait. We’re evil and always want some more!! Just joking. I know Clem and the team have made a wonderful job with this particular release, many things have been polished, lots of work involved. The overall performance enhancement makes LM7 a real alternative. I still use my old PIV 2,00 Ghz and Mint runs smooth as ever. Congratulations. Thanks for Gloria and congratulations! I installed Felicia and I am very happy with it except for the ati radeon mobility HD3650 compatibility problem. Any chance of it being fixed in LM 7? Iv been waiting for this ALL MONTH!!!! Iv been checking this site DAILY, Finally to see this notification. The screenies look smex. Gosh.. I love all the mint developers so much, Hugs all around. But what about upgrading from felicia , any hint or problems? Thank you so much! This is the most stylish and easy-to-use Linux distro, no doubt! Thanks Clem! Great job, everything works nicely! Nice one! I look forward to the upgrade becoming available so that I can try it out. DLing now. Thanks a bunch. Allright!! I’ve been waiting for this for a long time! Using torrent, I’m downloading at around 800 kb/s. Woohoo! Can’t wait to try out another successful release of Mint! I downloaded the 600mb ISO to do a mint4win install in Vista. The install only offered the 64 bit one and ignored the ISO completely. It did try to download the files again but failed with a 404 error. Could you consider adding the OEM installer to the next Universal Edition of Linux Mint? I imagine that for people who want to refurbish computers, install Mint, and distribute them, it would be very nice to have OEM install + no codecs. Hmm… I’m currently running RC1, yet when I tried a dist-upgrade, there were no upgrades. Was this released earlier than announced and possibly my box has already been upgraded to stable? I need to upgrade Mint 6 please. wow, another ootb experience on a toshiba satellite pro 2100, as was felicia on my acer one, this is such a great distro, kudo’s! excellent job to the mint dev team. running it now and it’s as stable as a sawhorse. Another one “Thank you Linux Mint”, very good work ! I downloaded the Mint 7 RC and following the upgrade procedure doesn’t seem to work at all. I selected dist-upgrade and refreshed and it didn’t show any packages and said mine was up to date. I have got a quick question…is there any way to stop the white box appearing around the “Menu” button? I am sure you know what I mean, it only has a white box around it once the menu has been used. If that can be resolved the desktop will 100% perfect! Great job. Anxiously awaiting upgrade path from Felicia. Awesome! Thank you! I can’t wait to try this on my Macbook. Already in love with Gloria. I’m using Gloria RC1, and I clicked “include dist-upgrade packages,” but after a refresh nothing new appeared. Why is this? I think you are one of the best linux distro. But for me you are the best distro that linux can have. Running Gloria on Dell laptop with Intel chip/intel graphics & homebuild desktop with AMD Athlon/nvidia graphics since Sunday. Want to thank all involved for another great release. Talk about a stunning release! Now Mint not only works great, but even the artwork warrants looks from people standing behind you! And replacing XChat-gnome by the real XChat was a good decision. I would love all this Minty Gnome Goodness in the KDE version too!!! By far this is the best version every!!! to work nice again. Perhaps it is due to my hardware. very, very good and more delicious then i expected to be. Thanks Clem, Husse, exploder and the whole Mint team. Wohooo. Congratulation to the community & KUDOS to the clem & team. very very congrats to the team. thanks a lot for this new release of my by far preferred Linux distro! congrats for the success and wish for more in upcoming days.thanks. i carry linux around with me.. got rid of all my U K X ubuntu cds..and just carry around mint 6 and 7 along with pclinuxos2009.1 kde/gnome editions, and crunchbang linux..
Everything works beautifully on my msi laptop (one having installed the driver for the sis670 chipset)! this Mint 7 is a pleasure! a BIG thank you to the Mint team for this fabulous distro!! While every release is a step up from the last, I feel like this release is a landmark one. It just feels like everything in Mint has reached a certain level of maturity. Congrats to everyone involved. Hopefully the x64 edition follows soon. And with better support for digital satellite TV. I can’t get MintUpdate to show anything to update to 7 from RC1. I enabled the dist upgrades option and refreshed but nothing came up. Are the updates not up yet or something? Been using Mint since 4 when I switched from MS XP, and every release has been a joy. Can’t wait to get this one set up on my machine, I’m no expert but everything is so easy and hassle free and just works. PS Also a big thank you to the forums, there has been one or two minor niggles, but so far nothing that can’t be solved. Great Job !! I will try it on my PC. The best OS i’ve ever been using. Thanks a lot for everyone who has been working on this great release. Great very thanks for you :). Nice and functional OS. Thank you. I’ve been waiting for this a long time. Great job. Will upgrade again when the 64bit is released. interesting that I installed M7 next to M6 and the install only gave me 2.5 gig space, anyway partitioned and moved space to give M7 25 gig. which was no probs. software manager freezes quite often(and have to force quit). loved that I could install straight from the cd/dvd instead of having to boot into desktop first. Mint is being designed for easy of use (for newbies) it would be good to have a check box (ala synaptic) so you could install the wanted software in one go instead of one at a time. I think it would just make things easier for newbies.still playing after 6 hours and the missus hasnt harassed me YET. I run a Pavillion dv4220tx laptop without any issues although I had to do a small tweak on my wireless network and had to install my mfc990cw wireless printer drivers from off brother website. excellent edition. Congratulations on your great work. I tried Linux for the first time about 5 weeks ago, and have been using Felicia for about 3 weeks. I’m still amazed at what Felicia does. Won’t use MS Windows again other than for watching sports on ESPN360. Same issues on the upgrade path with 7 RC1, enabled the dist-upgrade option, and refreshed the packages. Says I’m up to date, but the machine has been off since before 7 was released as stable…otherwise very very happy with this distro, and release. This linux distro is by far for me as a Vista user the best introduction to Linux. It’s clean, looking good, and stable. Credits to all the team who created this distro. Hey Clem, Mint is getting better and better with the newcoming releases. And i like it very much. I’m using it since nov 08′. Just one thing (that i can remember now :p). Judgin by the screenie of the top, i can see that the default font is Deja Vu. I’ve nothing against it but… the Deja Vu is a nice font for titles (windows’s title), but not for every thing. My advice, based on my experience on using nice (and non intrusive) font, is that we could use the very very nice Droid fonts by google. Maybe you could add it (like the nimbus theme :)) to the mint repos. And/Or install by default the sun-java6-fonts package, that comes with the extremely nice Lucida Sans. Well, i think that using one of those by everything (except the title) would be a small, but nice, improvement of the overall look. Have to say that M7 is far and away the best available distro these days, one that’s virtually impossible to go wrong with. Clem and the crew did a fantastic job with this new version. It installed without so much as a hiccup on my Dell XPS410 desktop. Had to tweak the wireless connection, but that took only a minute or so and now I’m into hour two of exploring this latest and greatest version of Mint. All I can say is “WOW, what a great OS!” ..A big Thank You to everyone involved in seeing it through to completion!! I’ve been using Mint on my main computer at work since Mint 5 and I love it! I haven’t been this excited about a new linux distro release in many years. Thanks for making such a solid, reliable, and polished distro that is much more than just a collection of packages. Keep up the good work, Clem! I’ve been running RC1 for a while now too. Like others, i don’t get any upgrades when i run mint-update with the dist-upgrade feature enabled. What’s up with that? Fantastic! I like to introduce friends and family to Linux whenever possible and Mint has been the perfect tool for the job since I started using it with the Mint 4 release. I’ve actually been tangibly excited for this release and I’m sure it will only make the ‘conversion’ process that much easier when showing people the ‘light’. Excellent job on the release and I can’t wait for it to finish downloading! Keep up the fantastic work on this distro of distros that caters perfectly to fresh blood and experienced users alike! I have see te videos, really good job! Waiting for the x64 edition, hope to see it soon. You, I tried to follow the instructions on the site that you link, but i didnt see the authorization tab that they said to import the key. Please explain this. I’m a huge Mint lover it’s a shame that it hangs up all the time on my UMPC which is Everex/Fic CE-260 with VIA 1.2 ghz processer , at least the previous Felicia worked on it (with some bugs but still). Never mind the netbook! I’ll wait for my beloved Felicia’s upgrade instructions, which i’ve ran on my desktop quiet a bit. As soon as I get home, I am starting the download. Thanks for all the hard work you do. I really do appreciate it. Also waiting for x64, adding this comment to push forward the cause. linux-mint-gloria: Warning: operating-system-32bit is deprecate, please use 64bit platform. I’m just curious why if the Universal does not have the proprietary stuff install but still a GNOME why it is almost twice the size as the regular release? I too are having difficulties upgrading from RC1 to the final release. Nothing seems to change when checking the “include new dist-upgrade packages” under preferences! Maybe the upgrades have already been deployed through normal updates?! I can’t really tell if I am still running RC1 or not..
I’ve tried to find out with “cat /etc/linuxmint/info” which gives the following.. States nothing abt RC1.. But it might never have? If you see nothing in mintupdate it’s probably because you’re up to date already. If you want to make sure, head on to http://packages.linuxmint.com/#7main and check that the versions you have installed correspond to those shown on that website. From the terminal, to quickly get the version for a particular tool : “apt version packagename”, for instance “apt version mintmenu”. I am like a child at Christmas every time there`s a new release. Wow! It work like a charm on my Inspiron6400 !! Wireless seam to be better, display is MUCH more good and I LOVE the new menu button!! thanks for your job!!! Congratulations for another very successful release! I love Linux Mint! I installed Linux Mint 7 on my DELL INSPIRON 5150, works great. The new theme is GREAT! Does universal edition support Hebrew? Thanks! x64 bit version coming when??? I’m also waiting for x64! Loads of thanks! No praise is enough for people behind this great Distro. Installing on 256MB Ram (Old Thinkpad 600x) also works! One has to choose the “direct install” option. Although a bit sticky when running it looks great! Up to now there is nothing that does not work correctly. I also tried to upgrade the RC1 and nothing to download, how do I check if it’s already happened, ie which version is now installed? This is by far the best linux desktop distro i ever tested. Me too – reinstallation is often a pain with dmraid. What is the status on the Mint 6 upgrade path? IMHO this is the best Linux desktop ever! Thanks a lot to Mint’s Team! one problem, mint 7 does not recognize the wifi at Acer Aspire 3100updates and the. So after installing i can not connect to the net, it is not possible to install the restricted drivers! about to install to hdd. Thanks guys 😉 good works! I’m waiting for the x64 version too. Please give us a short information how long we should wait. And thank you for your great work!!! It’s true – Mint 7 looks fantastic on my desktop computer but doesn’t work on my laptop Fujitsu Siemens Amilo Pi 1505 – cannot boot form CD with Mint 7 (and this one only). This will go on my lappy now, but waiting for 64 bit for the desktop. Mint Rules! Thanks for all the hard work! im still stuck with the LTS… is there gonna be a path to update from Elyssa to Gloria? Gloria is a wonderful release! I love the new mintmenu,the new themes & artwork and the even speedier boot up.can’t wait for the 64bit version for my desktop machine. awesome! downloading torrent right now. Cool, but I want to hold up upgrading as long as I can, because Mint 6 is doing fine. However, how long will Mint 6 be supported by the Linux Mint team? Thank you guys! After using Gloria for a couple of days I haven’t found a flaw yet. This is definitly the best distro I have used so far. Be proud of yourself for creating this amazing OS. I see an awful lot of people asking questions that Clem answered in the forum two days ago. To that end I thought it would be helpful to post his answers here also. I have to be honest, Mint 7 is out, it’s the Champion’s League final tonight.. and Barcelona is playing, so I won’t be working on that tonight, I’ll go to the pub instead 🙂 Now having said that, this will be my first priority and I won’t start anything else until the upgrade path for Mint 6 is tested and working well. I’m hoping it will be a simple matter of upgrading via APT. If it isn’t I’ll provide a tool to make the path trivial. Work on this edition will start after the Mint 6 upgrade path is finalized. I don’t expect much work for this edition as most of it was already ironed out for the Main Edition and it should be a simple matter of recompiling everything, porting things to that architecture and eventually testing everything again. @Mikey: Were you being serious or are you trying to start something back up again? Copy the mint4win.exe from the cd to the same folder the iso is in. thx, i’m waiting for x64. bagus…neh, jadi bingung mw pilih mana ubuntu atau mint. I installed it last night… best linux distro I have ever tried. Thank’s to Linux Mint Team!! How to Participate to Develop Linux Mint?? Het ziet er prachtig uit. En het werkt prima. Thanks! It looks beautiful. And it works. Looks awesome cant wait until I can update 6 🙂 thank you for your work! LinuxMint tim – najbolji ste, svaka cast!! If you have a problem with the sound skipping try to remove pulseaudio and install esound from packagemanager. Other then that I found Gloria to be the beste Linux-distro ever! AWESOME! This thing rocks me like the Hurricane of the same name! Download took 3+hrs for Mint 7(gloria)coutesy of BT.Burnt a disc and found this system so intuative. Am new to all this,following retirement wanted interesting hobby/pastime that is not to physically demanding as am some what limited in that area. Was given a few old PC’s back in 2001 to see how could make use of them, Mostly P2 & P3 types, never seen one prior to then. Since have built a few PC’s using Win 98-Win 2000 & XP, tried Ubuntu 8.10 for a while that was great but this is GREATER!–Use Celeron 2.6GHz on old ATX board by Jetway,with AGP Nyvidia 4200ti etc. The writers have a real winner, can do all I need a system to do, Can be Very Proud of themselves- CONGRATULATIONS X 100 ! Overall, Linux Mint is a very polished distro that improves and adds a whole lot more functionality and looks to Ubuntu 9.04! Gotta thank ya for an awesome distro… I mean Mint in general. Been using Elysa for quite a while now. I like it very much, recommend it to all my friends. I’m writing this from a live 7/Gloria disk… The video Won’t work properly on this version or 6 🙁 I’m using an old Acer Aspire 5000 AMD Turion 64 bit 1.6 GHz and 2 Gigs RAM… Do ya know what I have to do to make it work? It works well in Elysa. Thanx Again, for all you do! I decided to install Mint7 clean as a dual boot with Windows XP. It picked up the music, video, pictures, and document folders from my WinXP and made them as if they’re native folders for Mint as well. Is this something new or has it been available from previous edition? Either way, this is a delightful feature for me. I didn’t realize this until I opened up those folders on my brand new Mint7. I opened Rhythmbox and am now listening to my music collection. Awesome work clem and team. Gloria works gloriously. Thanks man. My mom had several (virus/programme) issues with WinXP so I looked around for an easy Linux distribution for her PC. Now I installed Linux Mint on her PC yesterday, and we were amazed by the smoothness and user-friendliness of the system. I got impressed by it so much that I installed Linux Mint on my own PC after several attempts with (X)Ubuntu over the past months. And for the fist time I actually got my CDROM player working out of the box. Thanks a lot Linux Mint people! Best Linux build ever!! Lookout, Micro$oft! Clem + team, it’s truly an amazing work. Very well done!!! Did clean install. No problems on Dell Inpsiron E1705 laptop. Only took about 20 minutes. Amazing. Looks great. I wish upgrades were easier. Didn’t even try it. Looks too intimidating. Oh well. Good excuse to clean up. Thanks to the whole team. Great job. @metamorphousthe, starting what up again? I did not see at top where Hebrew is mention, but now I see this. Sorry for to ask, English is not my best Language. Hebrew is more useful for some the work I do here in Israel, and I want try Linux Mint. Sorry for ask stupid question! 1. Is there a Linux Mint 7 on KDE programmed to appear? 2. Is there a way to make functional in Mint the built-in webcam in the DELL SP2208WFP Flat Panel Monitor? Thanks! Mint 7 rocks! I just installed it on my aged ThinkPad and it feels a bit quicker that Felicia with the same apps running. It even handles my wireless card! Many thanks again to Clem and all. Thanks to everyone that made this happen. I had it installed since RC on my laptop…waiting on 64 bit for my desktop ! Maybe the 64 bit edition could become the primary in the next release ? This would be great ! Thanks for your work guys (and girls ?) ! i am downloading it in this moment, but i’m worry about my documents when i install it, will they be erase or can i keep my old documents? or i will lose them? please somebody to help me! i do not have an external hard disk, you know cash problems.
! x64 for main distro ! Thanks. I can’t make a new install, I must make a upgrade from the v.6. ¿When will be ready the upgrade tool? I’ve just installed my first 64 bit cpu / motherboard bundle (GS7610 – AMD 754). I wonder if Gloria will be compatible? (I’ll try it and see). I’ve used too many distros to count but I always come back to mint – the best distro in my experience. Enabling the “Hide Arrows” of a panel (I’m Italian, I read “Mostrare i pulsanti di riduzione” in the panel properties) I saw that them show as “white spaces”. Thanks,great job Linux Mint team!!! But i’m desapointed with the mintupdate in portuguese (pt-pt) that dont work at all and i’ve reported in the forums the problem and seems that they have ignored it. Thanks for download …please remember to all crew LinuxMint … GBU …. work on the upgrade, my Felicia instalation got messed up, so I had to install Gloria clean. But Gloria runs faster than felicia!!! Bought Mint-7 DVD universal version and tried to view as live boot. Took about twenty minutes to load and then locked up as soon as all the desktop appeared. I was hoping for better. My computer runs other major destros without difficulty. Better luck next time. how can i save monitor setting in mint7KDE? Pingback: Linux Mint 7 « .:. UNILUG .:. to the linux mint team…. Well Done! I am sure linux mint is going to replace windows as my primary OS!!! More functionalities than Windows OS 7 Amazing!!!!!!!!!!! Why do we need windows after installing Linux Mint!!!?? I have the CD ISO with me, but last night when trying to install it i had a problem. Every step was fine but i could not pass the stage where they ask for my username, it says my username is invalid. I tried different usernames but still the installation refuses. Is there something that i’m missing here? awesome.. but my IrDA and USB Card Reader not working. any suggestion? Great stuff – easiest Linux distro to use, and no nasty brown GUI! It may be because of the laptop specs? Hi, may be somebody know how to switch on the built-in camera & WiFi?? I have a notebook, the light for WiFi is on, but no such device in the system. For camera no any indication light (for windows is switch on/off by ¨Fn + F10¨) but no such device in the system too. should I install any drivers? if yes where it can be found?